The book I've owned the longest is probably Jim Arnosky's Secrets of a Wildlife Watcher. Its been signed and dated to 1986, which indicates this book, still in pristine condition, has been in my collection since I was an apparently non-destructive 8-year-old. The next longest is probably Interstellar Pig by William Sleator which, along with the Coville's The Monster's Ring, was checked out from the local library more times than I had counted. Over the years, I've been steadily running out of room. I've reorganized, hemmed, hawed, and even moved hundreds of books into boxes for storage, a travesty to my viewing and collecting pleasure. 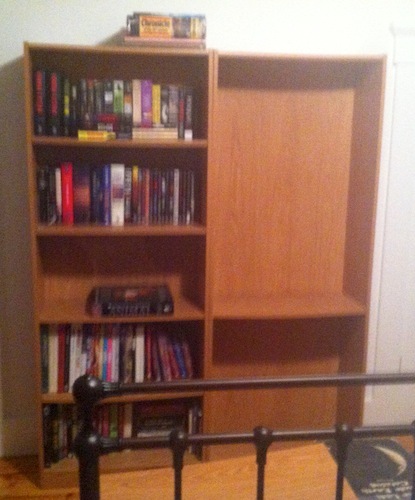 This past summer, I replaced nearly all my bookshelves with a solution that's given me more room in the same footprint. Its allowed me to put nearly all my books back on display, whilst still giving me room to grow. Two bedroom walls. The first is a five shelf main wall; the second is a three shelf side-wall. An in-progress dismantling. I didn't think to do "before" photos before it was too late. 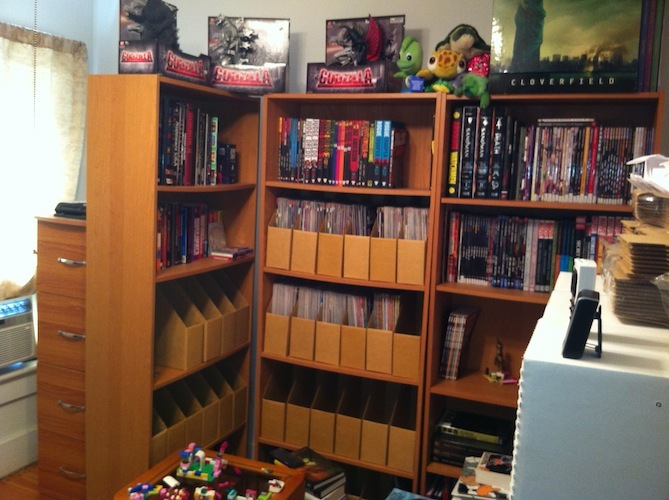 The five shelf layout in my office, with a small selection of boxes. More were stored in other rooms. The "After": Floor to ceiling! The cubified bedroom with a 5 x 7 (main wall) and 5 x 4 (side wall) cube layout. An 11 x 7 cube layout which follows the curve of my office walls. I had quite some difficulty trying to get a single image of the entire layout. This is one of the better attempts at using Photosynth. I just couldn't back up enough! Cube storage is a go! The cubes are made out of recycled cardboard, which makes them quite light at 4.4 pounds each. You build a cube by sticking the pieces together with double-sided adhesive tape from 3M. You might be saying "cardboard?! adhesive?! ", and you wouldn't be alone. But, besides the weight, they seem indistinguishable from the standard MDF or particleboard shelves you can buy cheaply nowadays. The colored laminate hides any indication they're made of cardboard and, when they're properly built and have rested for 24 hours, they're quite sturdy. 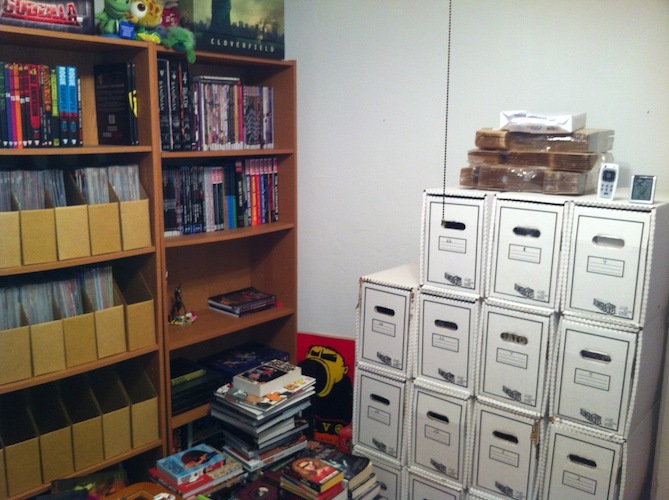 I've moved around cubes full of heavy books without mishap (and by supporting the required backboard, of course). If you look at my "before" pictures, you'll see the standard department store shelves I've had for years, with lots of wasted vertical space above the book tops. This is both because you only get a certain number of shelves (one of which is hardwired near the middle for stability) and because there tends to be only one optimal way to place them. A single shelf gives you 26.75 inches (″) of horizontal space. 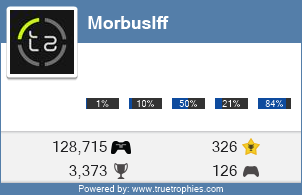 For a three shelf unit, that's a total of 80.25″, or 133.75″ for a five shelf unit. With the Way Basics cubes, I can get four shelves in the same space as a three shelf unit. A single cube offers 11.75″ of space. 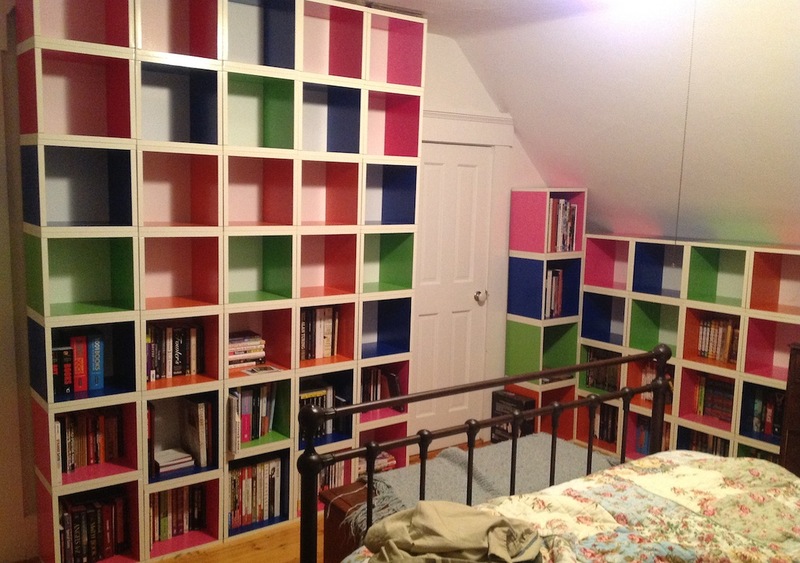 For the bedroom's side wall, which had two three shelf units, I had 160.5″ of horizontal space. 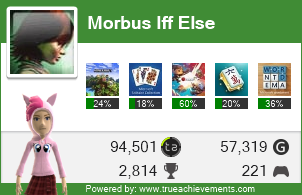 Replacing those shelves with cubes gave me 188″. 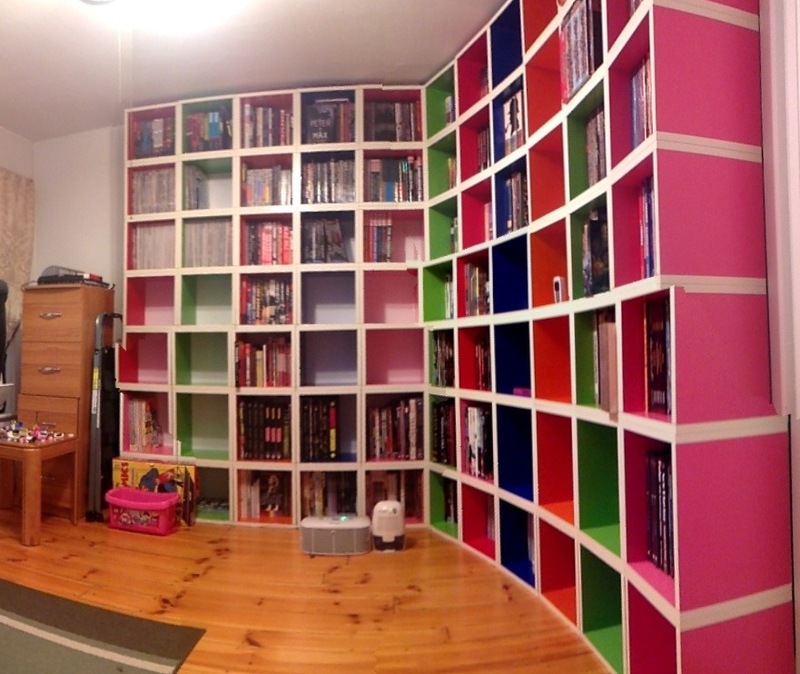 Since the cubes fit into tinier nooks than the full-blown shelves, I was also able to fit a fifth column on the side, bringing my total up to 235″, nearly 5½ feet of extra horizontal space in the same footprint. For floor to ceiling columns, something I could never do with department store bookshelves, the extra space gained is even larger. 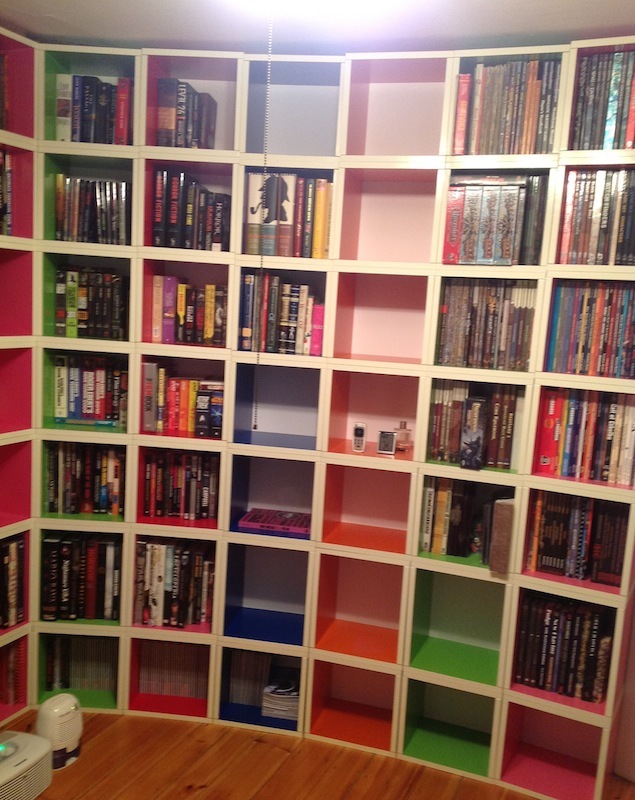 With six regular cubes and one plus-sized cube per column, I maximize the height for most of the books I own, while still allowing room for the various oversized items I have. You can see the Plus-sized cubes in the first or second rows of the floor to ceiling photos. 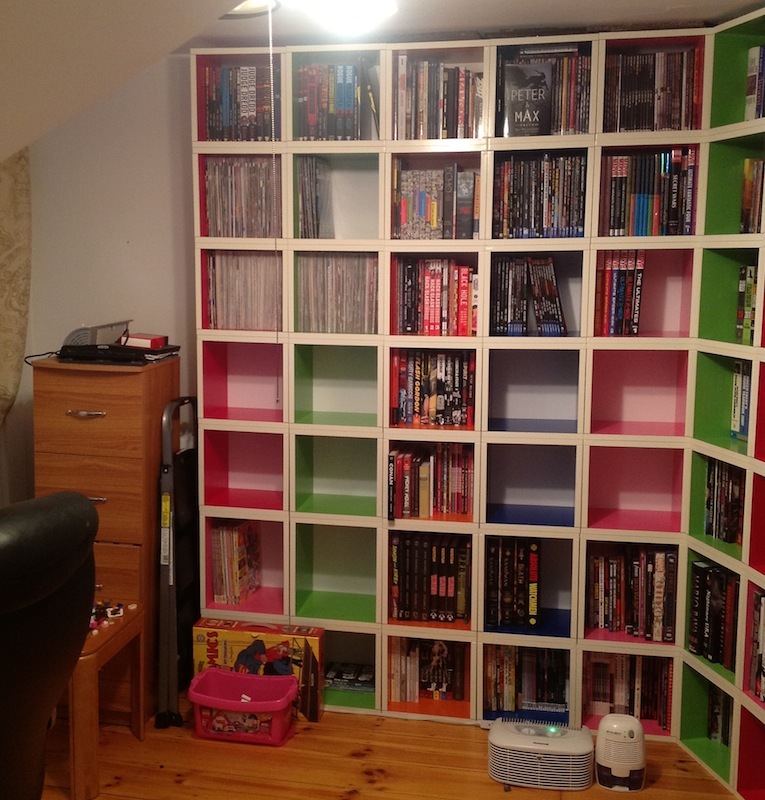 The fact that there are more "walls" to cube storage is actually a benefit in disguise: with most cheap bookshelves, your shelves will start to sag over time. 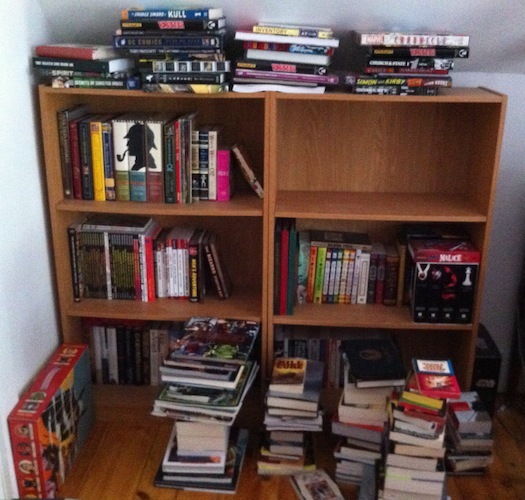 It was a habit of mine to flip my shelves, like a mattress, every six months or so. With cubes, every horizontal shelf is reinforced either by the floor or the top of the cube beneath it. I haven't had them long enough to notice any sagging, but my guess is that it won't be a problem. No more mattress flipping! Way Basics storage cubes come in a variety of colors, and I spent many an hour drafting up cute little patterns and schemes in a drawing program. After building a 5 x 7 pattern (for the bedroom's main wall), I found that you don't really notice the pattern unless you actively look for it. I switched over to single colors per column (for the office walls), and they become a bit more noticeable. If color isn't your thing, they also offer black, white, and a few wood grains. I've looked into storage cubes before, but always found them to be too expensive (locking wooden crates that cost a ton to ship), too bookshelve-y (a single unit with nine cubicles defeats a lot of the advantages of cube storage), or too flimsy (full plastic walls that weren't sturdy enough, milk crates that didn't have enough flat surfaces, etc.). The Way Basics cubes have none of these problems, and after two months of testing and three months of completion, I'm quite thrilled with the result! Incidentally, if you're wondering why you're not seeing any mass-market paperbacks, it's because they're all stored on DVD shelving units available from MediaShelving.com. I've three of these in my house, with a fourth slowly inching its way into necessity.